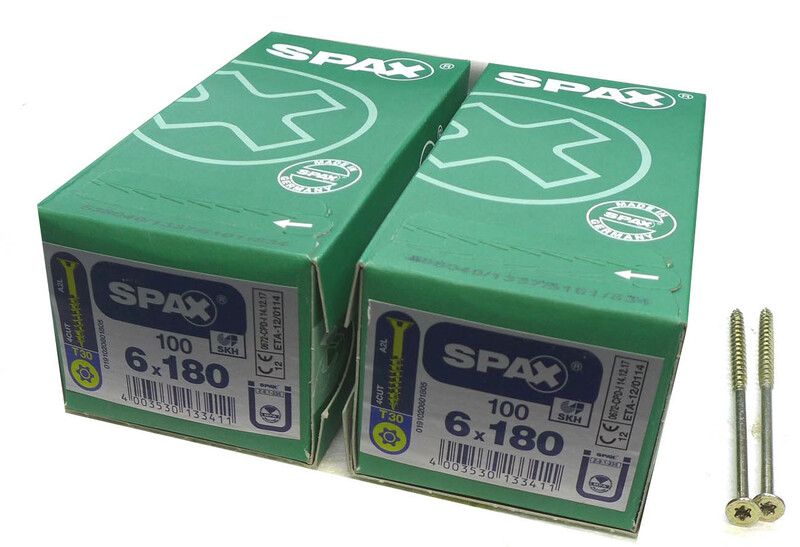 Spax Extra Long Flat Head Partial thread screws (2 1/2" of thread on all sizes) - 6x180mm . Equivalent to #14 x 7". T30 torx drive. Yellow zinc plating for rust resistance. Great for attaching rain gutters to facia boards and other applications requiring strength and durability in an extra long fastener. These come 100pc per box and sale is for 2 boxes (ie, 200pc). Shipping is $10.00 per 200pc lot. Limited supply - Spax is no longer importing this size from Germany. Regular discount price is $38.00 for a box of 100pc. Buying this 2 box lot drops it to $25.00 per hundred.